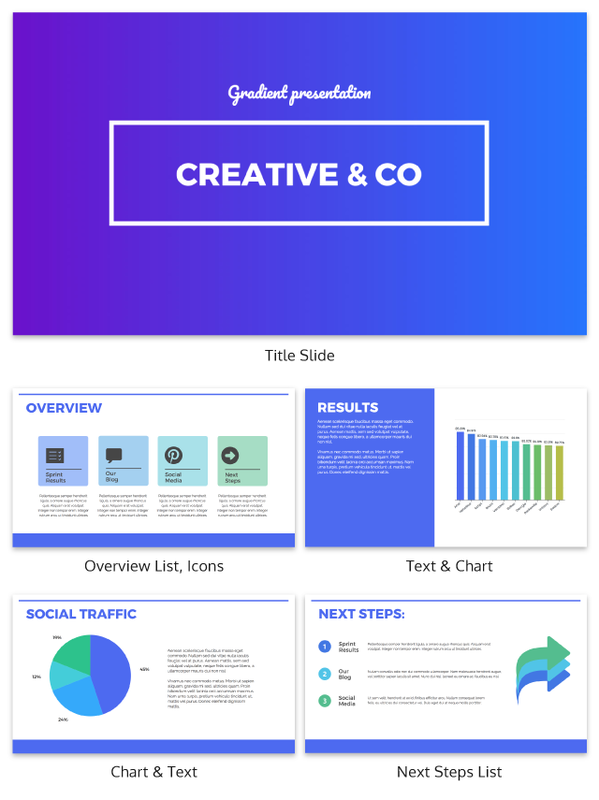 You'll Feel Like A Professional Designer Once You Have Made Your Own Presentation Using This Gradient Creative Presentation Template! Take your presentation to the next level and get artistic with this Gradient Creative Presentation! You can use the template for anything including your business, a public speaking event, or for a special report. The Gradient Creative Presentation can be fully customized and you can keep it simple or as detailed as you want. We have a large selection of backgrounds and colors for a gradient design that works for you. This Gradient Creative Presentation template can also be edited to feature tables, charts, graphs, images, and icons. If you like, you can upload your own photos or choose from our high-quality pictures for a more modern feel.